Dave James, a newspaperman who worked for the Shelton Independent, The Tacoma News Tribune, Seattle Times,and The Associated Press, grew up within sight of the Mason County Logging Company donkey engines that worked in the Black Hills near his home. In 1947 James became Simpson Timber Company's public-relations director, rising to vice president. He retired in 1975. Colleagues regarded James as one of the state's best writers and raconteurs. Time magazine wrote that his "sly exaggerations, as American as roasting ears, would have tickled Artemus Ward, Mark Twain or Will Rogers." 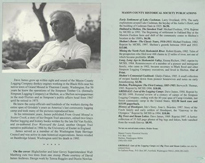 Besides researching two books on the James family's Oregon Trail roots, James wrote two books on forest history and edited several books on forestry for Northwest authors. 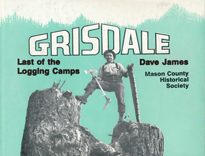 His book Grisdale: Last of the Logging Camps (1986) chronicles the story of Simpson Timber's main logging camp in the South Olympic mountains. The book features a large number of historic photographs and is available through the Bainbridge Public Library local author's collection.